Lori Brothers is the Director of The Dean Ornish Program For Reversing Heart Disease at Jameson Hospital, New Castle, PA. She has been a Lifestyle Educator and writer for over 20 years. 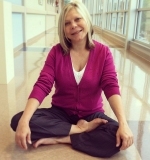 She is a Yoga Alliance certified yoga therapist and instructor with a background in Phoenix Rising Yoga Therapy and Integrative Yoga. Lori earned her BA in English Lit and Journalism from Youngstown State University. Please check out the Jameson Health System Dean Ornish Program website. You can reach Lori by email. The edge is that place where you are challenging yourself but not pushing beyond a safe limit. You are comfortably active. Finding a “safe edge” is important during retirement so that you don’t get over-extended, yet you move forward into new directions, interests and contributions. When you retire, it may take a while to establish your comfortable edge, an edge that is personal and meaningful to you. Wise choices keep your edge sharp. Living on the edge during retirement means you’re growing in understanding, wisdom, depth and clarity. It is essential that you maintain a healthy attitude about stretching and growing in strength, both physically and metaphorically. Those who live well grow. Retirement is the opportunity to explore. If you’ve been very engaged in what others expect of you, or like many retirees, feel even busier now that you’ve transitioned into retirement, finding balance is important. Be willing to look at where you were out of balance before you retired, and be honest about whether those patterns are still playing out in your retirement. Stagnancy can become debilitating. It can be a simple act such as getting a new house plant to symbolize your fresh start, or making sure you are choosing to feed yourself healthy food to build your vitality. Staying active is first a state of mind. Check your mind-set to look for where you’ve closed doors. Along with a state of mind, an open state of heart is also valuable and necessary to thrive. In retirement, the heart of the matter is you. The heart is more than the center or focus of the matter. The heart has depth, feeling and freedom of expression. It involves refining your human experience to become even more exquisite and unique. This may be foreign at first if you’ve spent many of your years taking care of others, or working full time, or both. Retirement is breaking out of the routine. In transition, first there can be a sense of feeling lost. “Boredom” is having nothing to focus on. However, be willing to accept that feeling lost and the sense of “nothing to do” can actually be the fertile ground for new beginnings. Look for one new interest or activity per week. Be careful not to fill all of your time with social events or obligations to help others. Instead, spend a few hours one day per week reaching out for something new. This weekly activity is the planting of new seeds. Some will take root and anchor into the soil of what can become the best part of your life. The point of this practice isn’t necessarily to spend money, even though new interests may require small investments of time and money. Explorations may prompt you in ways to draw out the feelings that move you in the direction of the heart. And those feelings are the ones that keep you vibrant, youthful and engaged in life. Make room for new ideas. Your health and well-being depend upon your willingness and your positive attitude. Please understand that dedicating your attention to the best you can still contribute includes how you choose to take care of yourself, and play a role in your health. Statistics show that you have an average of 18 years to live beyond your retirement, and maybe much more, if you can restore the vital forces that keep you engaged, purposed and contributing. Be determined, no matter where you are on this golden path, to make it personal and make it count. Social media can connect you with others who restore cars, listen to the radio or collect buttons. Whatever your interests, pursue them with the joy and enthusiasm of defining your edge. Ultimately, finding your edge is an attitude. When you maintain your sense of adventure, and you are willing to meet your best in your own life, you open up to the countless treasures that still await you.